A significant part of sorting my father's memorabilia involved showing him old photos and recording his recollections. What became apparent after our first few sessions was that it was often the people connected to the photo and not just the car or race that were so significant. While not complete, the following attempts to recognize those people which were connected to Jack's racing career. Lindley is credited with amongst other things, being a pioneer in starting Vintage car racing. In the 1950s, this was referred to as "Veteran" car racing. Lindley built a fabulous collection of cars which by 1954 was the largest private collection of antique automobiles in the USA outside those held by public museums. At its peak, his fleet numbered 88 different cars including the Czar of Russia’s 1911 Rolls Royce; English King George V’s 1910 Daimler; Henry Huntington’s (Southern Pacific railroad magnate) 1912 Lozier; Indy 500 speedster Dario Resta’s famous 1913 Peugeot; and two of racing legend Barney Oldfield’s most famous machines, his 1907 Stearns and a 1907 Benz.. 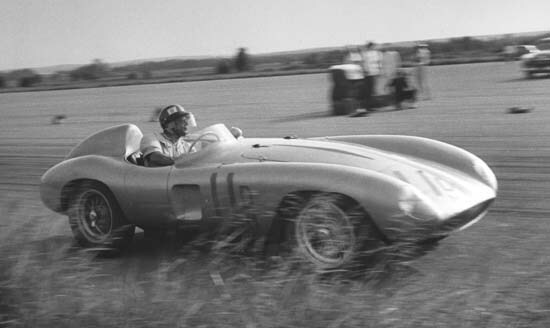 In conjunction with sports car racing events, Lindley would put on exhibition races using his numerous "veteran" racers and allowing Jack to drive one of them. 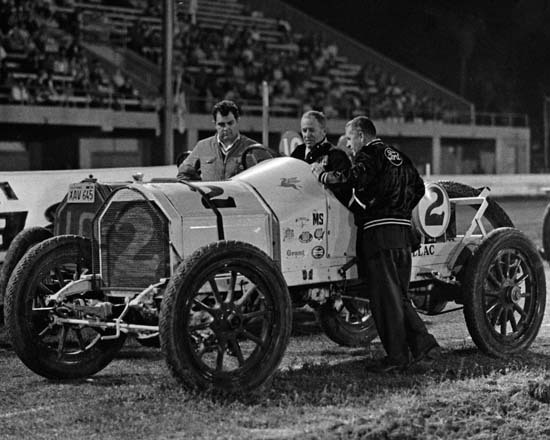 Here is a pre-race photo from the Del Mar Fairgrounds in CA showing Jack(left) and Lindley(center) admiring his Cadillac racer. 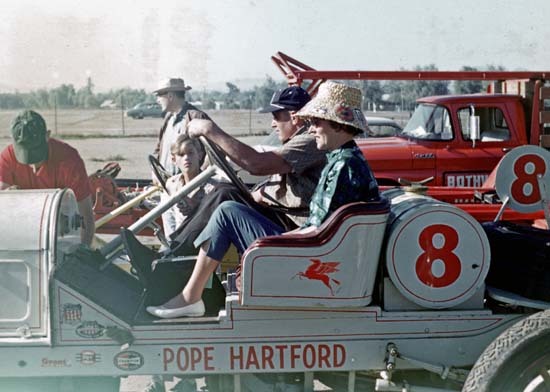 Here's Lindley and his wife Ann taken at Riverside Raceway. Vintage Racecar magazine’s two part article on John Edgar couldn’t have been titled any better: “Like Nobody’s Business”. 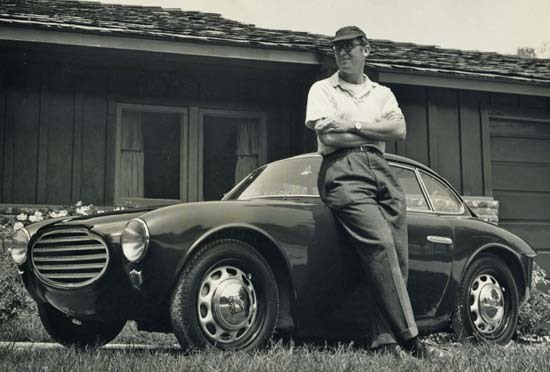 While the East Coast had the likes of Briggs Cunningham and later Jim Kimberly, setting the bar of professionalism for sports car racing on the “other” coast was John Edgar. Like most, Edgar’s first taste of a sports car came in the form of a 1947 MG TC. Hot Rodder Ernie McAfee was hired to install a super charger amongst other modifications making it a real contender in early events…when it finished. The high-strung TC was later replaced by a 4.1 Ferrari that Jack McAfee soon after drove to an overall win at the 1953 Palm Springs feature event. Porsche Spyders and more Ferraris would follow over the next decade, eventually ending with Maseratis. But if Edgar’s stable sounded impressive, so were his drivers: Dan Gurney, Carol Shelby, Pete Lovely, Bruce Kessler, Jack McAfee, Richie Ginther, Bill Pollak, Masten Gregory, Skip Hudson & Chuck Daigh Today Edgar’s photos and memories are shared by the writing of his son William who manages the Edgar Motorsports Archive. Below is a photo of John Edgar (left) next to Jack McAfee (right). 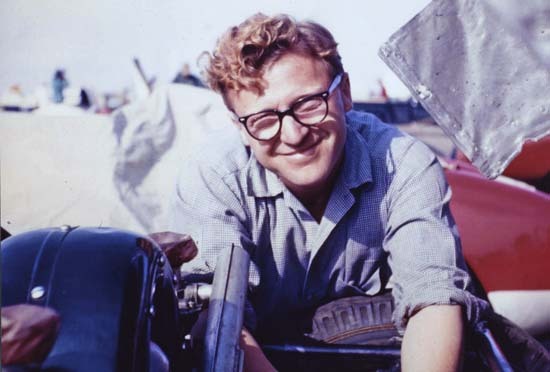 On July 24, 1949, a 22 year old Phil Hill entered his MG-TC in the Sports Car event at Carrell Speedway in Gardena California. He won his qualifying heat, the trophy dash, and the main event that afternoon; the well-mannered young man from Santa Monica had made his introduction. During the next six years, Phil submersed himself into both the mechanics and piloting of sports cars. 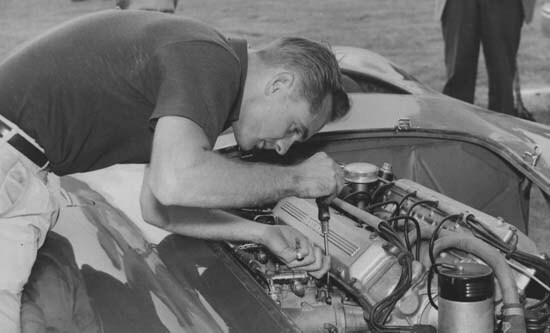 His accomplishments would lead to the SCCA National Class D title in 1955. Ferrari took note and signed Phil the following year; a relationship that would eventually give Hill 30 major victories driving the prancing horse, including the World Grand Prix Champion title in 1961. But forget all of his victories and titles; Phil is most remembered as a True Gentleman. As my Dad once remarked about Harry, "a golden friend who loved racing even more than I did". Harry Jones owned an auto-body repair shop in Burbank CA near McAfee Motors. The two became friends and Harry was consequently introduced to Sports Car racing. 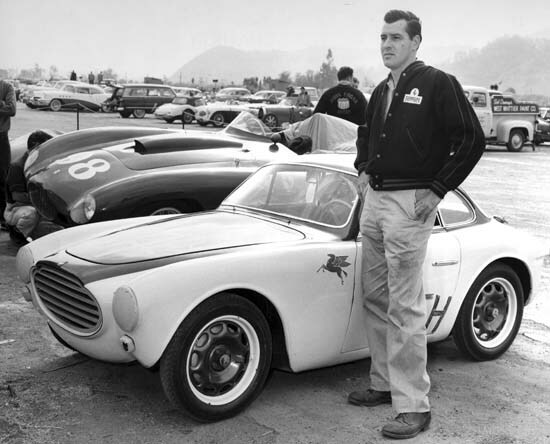 In 1959, Harry won the SCCA H-modified Pacific Crown in a 750cc Crosley powered Lotus. 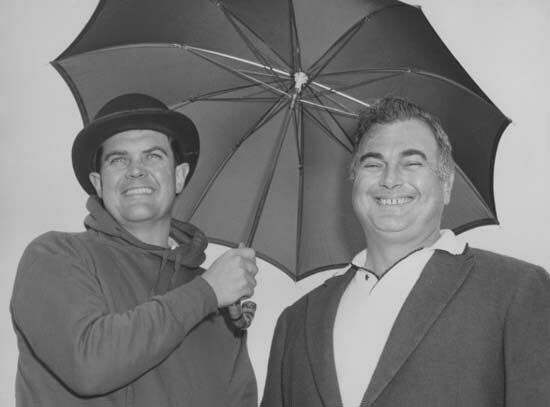 Harry is also credited with convincing "Mac" (how he called McAfee) to run one more season in 1961. Harry bought a Lotus Forumula Jr., reworked the motor and frame, and together they won the SCCA Pacific Crown for that class. One of the most loved and charismatic individuals of the West Coast sports car community, Henry was a man of class and wide spread interests. His well-healed status allowed him to acquire "foreign cars" very early during the 1950s including the makes of Ferrari, Lancia and Moretti. As for his "At Large with Henry Manney" column in Road & Track magazine, he covered numerous European Grand Prix events where he built a reputation of respect and professionalism with the drivers, mechanics, and team owners. But it was his time spent between races that gave Henry the opportunity to report on much more than just the start and finish order of a race. Reviews of local food, wine, hotels and other travel related bits were written with a sense of wit and humor that nobody in the motor press world has ever repeated. As of Henry’s passing, one fan wrote “To me, he was the best sports journalist of his time. Goodbye, Henry. May you forever be At Large”. Appropriately labeled "America's first Porsche legend" by historian Michael Lynch, Johnny von Neumann's sports car career began in 1947 as an employee at Roger Barlow's import car business in Los Angeles CA. There he met a mechanic hamed Phil Hill who he would later sponsor in racing as he would with Ken Miles and Richie Ginther. von Neumann founded the California Sports Car Club and would eventually become the West Coast Distributor for VW and Porsche. Ferraris were also a big part of von Neumann's taste as he is shown below plioting one of his Monzas. 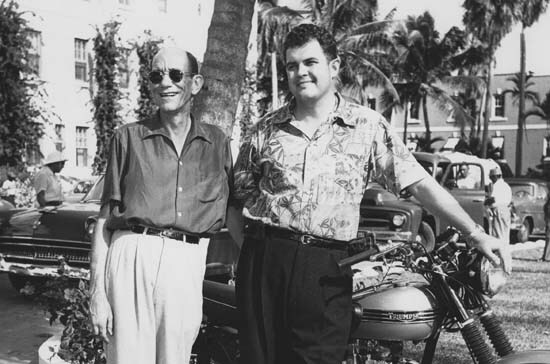 Note that von Neumann painted his Ferraris silver, and his Porsches red. Johnny gave Jack McAfee his first Porsche ride(and vicotory) at Moffet Field in Mountain View CA in 1953 driving a special ordered American Roadster which now sits in the Porsche museum. Tony Parravano 1917 - ?